"Quality Deer Management principles, responsible members, and ethical practices"
Back Woods Hunt Club, Inc. is an incorporated business, and privately owned entity. We are dedicated to providing the optimum experience for the serious whitetail deer hunter in North Western North Carolina. We have quality members who are professional, responsible sportsmen, both in the field, and in our personal lives, which is what makes this club truly successful. We do not measure success by the number of deer harvested but by the quality of the hunting experience and the chance to take a trophy buck. The Back Woods Hunt Club Inc. method is simple. The club is based upon Quality Deer Management principles, responsible members, and ethical practices. We acquire prime whitetail deer and turkey habitat and manage it for long periods of time. Our management plan includes establishing food plots, reducing the buck to doe ratio, and maintaining guidelines for harvesting mature wildlife. We are committed to wildlife management and firmly believe in Quality Deer Management. Not only are we dedicated to these principles, we are also committed to improving our club properties, and making the hunting experience the best it can be for our club members. We pride our self in obtaining prime hunting land. Our club properties offer all types of hunting from farm land and cutover timber, to mature hardwoods and rugged mountains. We have approximately 8000 acres of hunting property in Iredell, Davie, Surry, Alleghany, Caldwell, Wilkes, and Yadkin counties in North Carolina and also Patrick County, Virginia. We are presently looking at more property in North Western North Carolina for our club members to hunt. As you can see, the club has a website that will assist our members in several ways. The maps provide an opportunity to see the land you will be hunting. The photo gallery will allow members to see pictures of the "trophies" that have been harvested by our members. Several interesting links are also provided. The club has a private members only forum which provides members with stand site maps, detailed property information, detailed harvest records, and a place to share member only information. 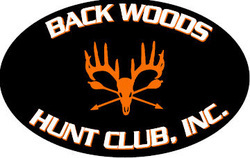 We welcome all members for the 2019 hunting season and look forward to the qualities that each member brings to the Back Woods Hunt Club Inc. It is our goal to obtain good hunting leases and to recruit professional, responsible members that will work together to develop long lasting friendships, productive hunting lands, and memorable experiences for years to come. If there is anything we can do to make your membership more enjoyable please feel free to contact us.